At present we are into one of those annoying parts of ocean racing where the numbers paint a misleading picture of what is actually going on on the water. The number would have us believe that Spindrift 2 has done a reasonable job over the last couple days and has reduced her deficit on Jules Verne Trophy holder Banque Populaire V from 575 miles at 0800 UTC on New Year's Eve down to 201 miles at the same time today. But these figures are calculated in terms of distance to finish, which might be fine if both boats hadn't been forced to carry out a massive detour off to the west to avoid the Azores high - the present meteorological scenario being surprisingly similar to the one which Loick Peyron and the Banque Populaire crew encountered four years ago. In reality, on the 320° course they are/were both on, Spindrift 2 is some 982 miles astern of Banque Populaire V's progress - which looks less promising. In fact the official numbers will start to reflect this too over the next 48 hours. Apart from a small hitch to the northwest to get into a stronger lane of breeze, Banque Populaire V made her final gybe for the finish on the equivalent of 1100 tomorrow (Sunday). It seems likely that the westerly reach of the high on this occasion will be even more extreme than it was four years ago. This means Spindrift 2 will have to sail more miles west and even then may encounter lighter conditions and won't be able to maintain her present 28+ knot boat speed average. The forecast still has a second area of high pressure filling into the northwest of the Azores high tomorrow night, turning this into a windless zone, however the high is due to head east faster than Spindrift 2 and the wind should have filled in for the world's biggest trimaran to the northwest of the high by Monday morning. From there it will be a rock'n'roll ride ahead of a front directly to the finish for Dona Bertarelli, Yann Guichard and their crew...and they will need to be ultra-fast final miles if they are to catch up the lost miles. 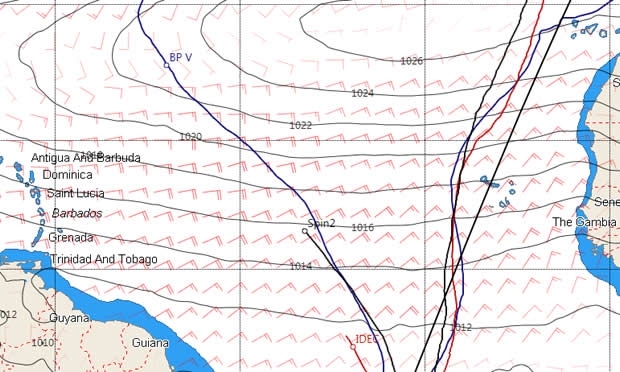 Francis Joyon and the crew on IDEC Sport crossed the Equator at around 1900 UTC last night. She now appears to be through the Doldrums and into the northeasterly trades. She too has dramatically reduced her deficit on the record holders - down from almost 1200 miles behind 48 hours ago to 562 miles at 0830 UTC this morning. IDEC Sport shaved Recife much more closely than Banque Populaire or Spindrift 2 did ahead of her and her course remains some 145 miles to the left of Spindrift's at this stage. At present it doesn't look like IDEC Sport will be able to sail any less far west to round the Azores high than Spindrift 2 or Banque Populaire V, however she should be able to key into the strong following winds to the northwest of the high sooner than Spindrift 2. Sadly after such a titanic effort, it looks like her chances of breaking the Jules Verne Trophy record have slipped away. To match Banque Populaire V's record time Spindrift 2 needs to reach the finish by 17:44:51 UTC on Wedneday (6th Jan) while IDEC Sport needs to be there just before, at 15:45 UTC.